Immunogen :The antibody was produced against rat IgG whole molecule. Purification :Immunoaffinity chromatography followed by solid phase adsorption. Stability :1yr at –20oC from date of shipment. 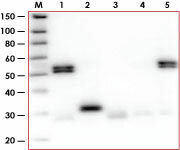 Sample Data :Western Blot of Anti-RAT, HRP Conjugated antibody (1:1000). Lane M: 3 µl Molecular Ladder. Lane 1: Rat IgG whole molecule. Lane 2: Rat IgG F(c) Fragment. Lane 3: Rat IgG Fab Fragment (p/n 012-0105). Lane 4: Rat IgM Whole Molecule. Lane 5: Rat Serum. All samples were reduced. Load: 50 ng per lane.